Let us introduce you to the most unique, specialized and exciting experience on the Gold Coast. Ride your own Jet Ski and feel the freedom and exhilaration that Jet Ski Safaris has to offer as you explore the wild blue yonder and the hidden islands of paradise. 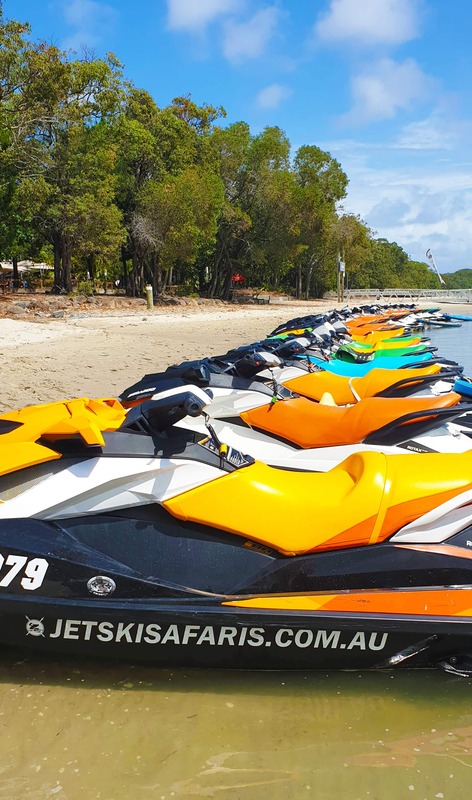 Meet local dolphins, turtles, dugongs and wallabies that inhabit this wonderful Jet Ski paradise. Led by a team of professional guides with vast knowledge of the local waterways you are assured of an adventure you will never forget. 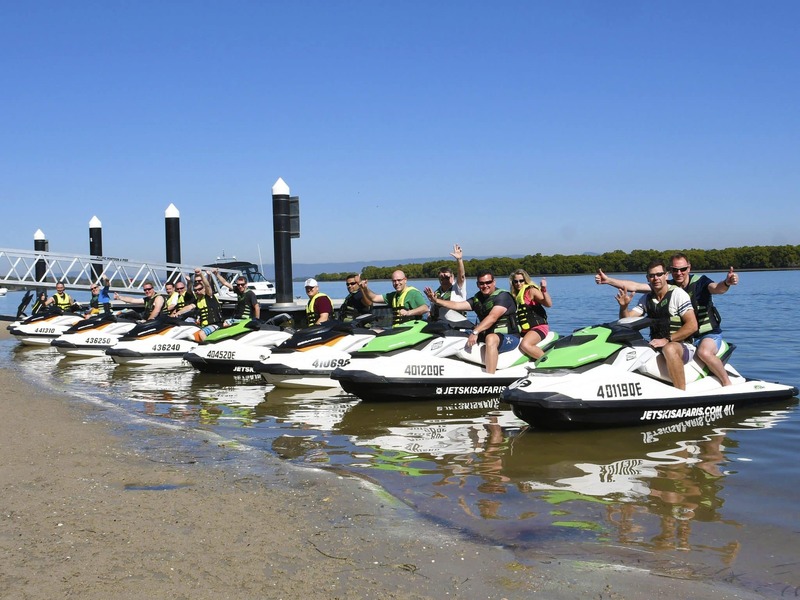 With over 18 years operating experience, we are considered by everyone who has ever ridden with us, to be the ultimate of all water sports or any other activity on the Gold Coast. 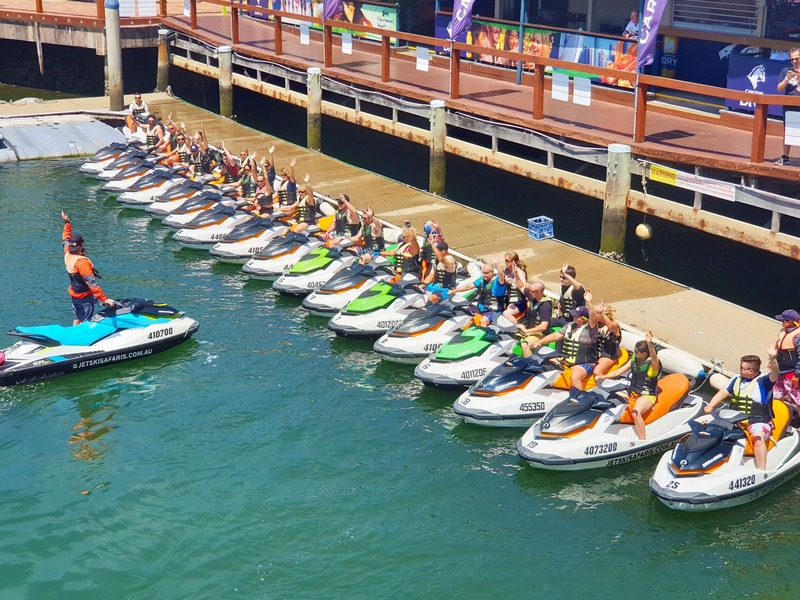 With the largest fleet of Jet Skis in Australia, we can easily accommodate up to 50 guests on a twin share basis or 25 single riders. In addition to our regular safaris, we have designed exclusive packages for our Corporate and Group Events, which we can cater for as many as 160 guests with rotations between various water sport activities. that inhabit the Island. All of this before turning around and making our way back home. We also have the option of extending your stay at South Stradbroke Island for either morning tea, lunch or afternoon tea at the beautiful tropical island bar. We will always go the extra mile to ensure customers have a memorable time, full of exhilaration and serious fun within a professional and safe environment. Check out our package deals to give you an idea of what we have to offer! Not quite what you are looking for? Feel free to give us a call and talk to one of our friendly staff, we will be happy to tailor a package to suit you. Objective: Form immediate bonds by getting people out of the work place and having fun, TOGETHER! A customised interactive team building safari, tailored to suit your requirements is exactly what you need. 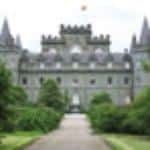 We have team building safaris which will have your crew working together to solve the clues in a range of fun activities completing both psychical and mental tasks to locate the hidden treasure. Add a little extra create a theme, dress up and improve the team morale with one of our safaris on offer. Why stop at jet skiing?? Ask us about our great packages we combine with our partner operators that we have on hand. Intensify the fun by adding a Jet Boat ride, Jet pack or Helicopter flight. We are happy to work with you to create the best package to suit your needs. Call our friendly team to discuss what discount options are available for your group. 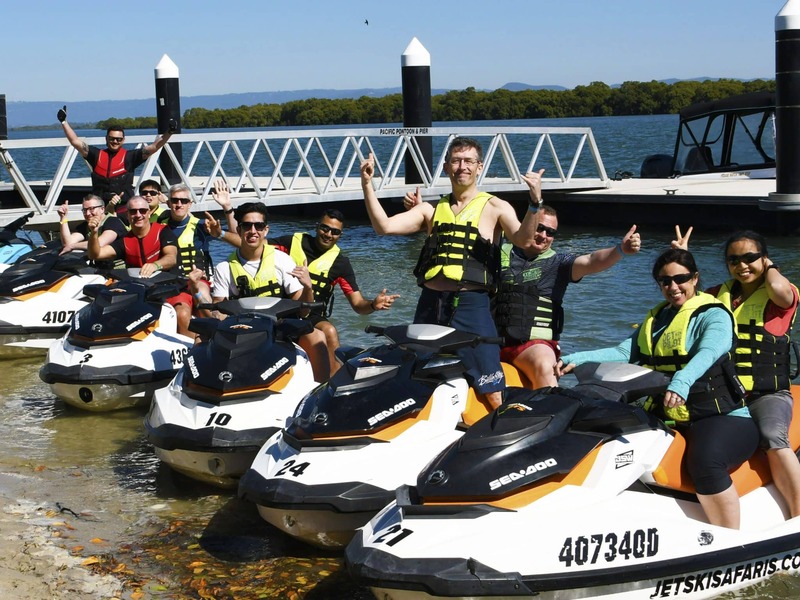 Get ready for a one hour South Stradbroke Island adventure thrill of a lifetime! Blast your way along the broad water heading north for a good 15kms weaving our way up past beautiful islands, beaches, sandbars and mangroves before turning around and continuing the fun on route back to base. 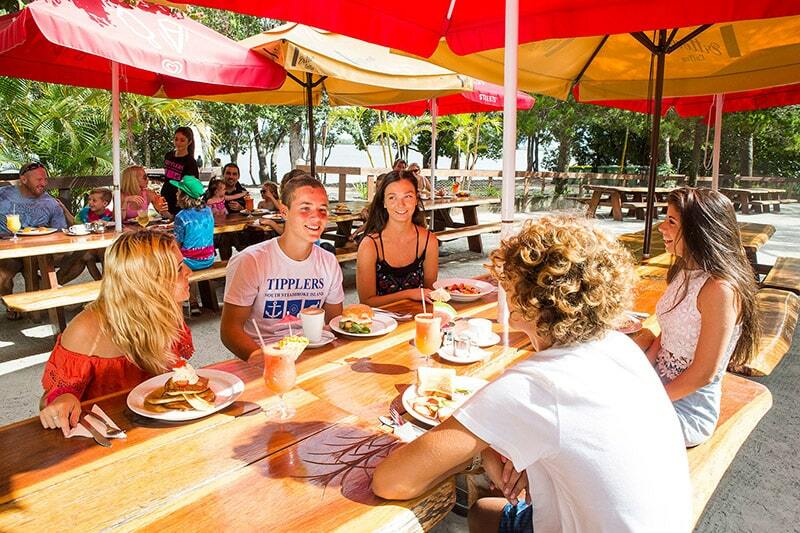 Upon return from your fantastic adventure, your team can choose from any of the great restaurants or stop off at Fishermans Wharf Tavern for a cold beverage to finish the day off. Blast your way along the beautiful sub tropical shores of South Stradbroke Island. Heading north for at least 20kms weaving our way up way up past beautiful islands, beaches, sandbars and mangroves before arriving at the Tipplers Cafe on South Stradbroke Island to enjoy a cool beverage and meet the local wallabies that inhabit the Island. All of this before turning around and making our way back home. We can give you the option of extending your stay at South Stradbroke Island for either morning tea, lunch or afternoon tea at the beautiful tropical island bar. It’s a full on mission that will have you on the edge of your ski! 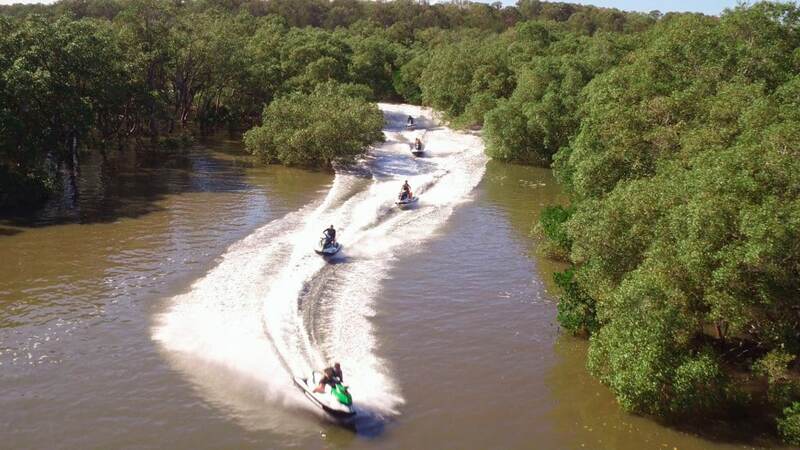 Follow us through the narrow high tide passages that whip and snake their way around through miles of untamed mangroves and flood plains right up to North Stradbroke Island. This trip boasts an epic 80km round trip. On the way back we pull into a beautiful tropical bar for a break where you can have a swim and a nice beverage or even extend your stay for lunch or afternoon tea. SOME OF OUR CORPORATE CLIENTS INCLUDE. Please read the 900+ reviews on TripAdvisor to see why we are voted #1 BEST THING TO DO ON THE GOLD COAST! Note: Additional charges will apply if catering is required at the island. 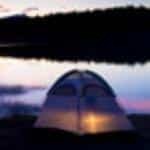 The above packages and rates only apply to corporate or group bookings. These prices are not valid from 14th December to 14th January.